What Are Food Molds – Are Molds Dangerous? Some of the following information is from the United States Department of Agriculture, Food Safety and Inspection Service (FSIS). Photo courtesy of the U.S. Environmental Protection Agency (EPA). Molds are microscopic fungi that live on plant or animal matter.Mold grows from tiny spores that float around in the air. When some of these spores fall onto a piece of damp food, they grow into mold. 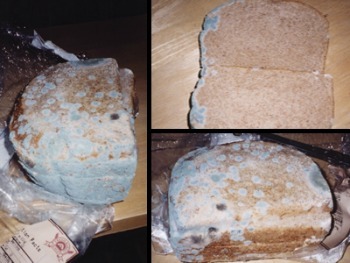 Food mold feeds itself by producing chemicals that make the food break down and start to rot. As the bread rots, the mold grows. There are thousands of different kinds of molds. One mold that grows on lemons looks like a blue-green powder. A mold that grows on strawberries is a grayish-white fuzz. A common mold that grows on bread looks like white cottony fuzz at first. If you watch that mold for a few days, it will turn black. The tiny black dots are its spores, which can grow to produce more mold. No one knows how many species of fungi exist, but estimates range from tens of thousands to perhaps 300,000 or more. Most are filamentous (thread like) organisms and the production of spores is characteristic of fungi in general. These spores can be transported by air, water, or insects. Yes, some molds cause allergic reactions and respiratory problems. And a few molds, in the right conditions, produce mycotoxins, poisonous substances that can make you sick. What Are Mycotoxins? Mycotoxins are poisonous substances produced by certain molds found primarily in grain and nut crops, but are also known to be on celery, grape juice, apples, and other produce. There are many of them and scientists are continually discovering new ones. The Food and Agriculture Organization (FAO) of the United Nations estimates that 25% of the world’s food crops are affected by mycotoxins, of which the most notorious are aflatoxins. What is Aflatoxin? Aflatoxin is a cancer-causing poison produced by certain fungi in or on foods and feeds, especially in field corn and peanuts. They are probably the best known and most intensively researched mycotoxins in the world. Aflatoxins have been associated with various diseases, such as aflatoxicosis in livestock, domestic animals, and humans throughout the world. Many countries try to limit exposure to aflatoxin by regulating and monitoring its presence on commodities intended for use as food and feed. The prevention of aflatoxin is one of the most challenging toxicology issues of present time. Cheese Molds: An exception is mold on hard cheese, as some cheeses are eaten only after they become moldy! Blue cheese gets its flavor from the veins of blue-green mold in it. When a blue cheese is formed into a wheel, holes are poked through it with thin skewers. Air gets into these holes, and a very special kind of mold grows there as the cheese ripens. If mold develops, cut away one (1) inch on each side of the cheese (throw away) and use the remainder as soon as possible. According to the Mayo Clinic, some moldy cheeses are safe to eat after the mold has been sliced off, while others are toxic. Hard and semisoft cheese, such as parmesan, Swiss, romano and cheddar, you can cut away the moldy part and eat the rest of the cheese. Cut off at least 1-inch around and below the moldy spot. With soft cheeses, such as brie, chevre (goat cheese), blue cheese, and ricotta, the mold that grows on these cheeses cannot be safely removed so they should be discarded. One reason is that the molds can more easily penetrate into the heart of soft cheeses than they can into harder cheeses. This causes spoilage from within that cannot be scraped away. The same goes for any cheese that has been shredded, crumbled or sliced. If mold is found on soft cheese (i.e. cottage cheese, cream cheese) the entire package should be discarded. Mold on soft cheeses are toxic. No – you only see part of the mold on the surface of food – gray fur on forgotten bologna, fuzzy green dots on bread, white dust on Cheddar, coin-size velvety circles on fruits, and furry growth on the surface of jellies. When a food shows heavy mold growth, “root” threads have invaded it deeply. In dangerous molds, poisonous substances are often contained in and around these threads. In some cases, toxins may have spread throughout the food. While most molds prefer warmer temperatures, they can grow at refrigerator temperatures, too. Molds also tolerate salt and sugar better than most other food invaders. Therefore, molds can grow in refrigerated jams and jelly and on cured, salty meats (ham, bacon, salami, and bologna). Cleanliness is vital in controlling mold, because mold spores from contaminated food can build up in your refrigerator, dishcloths and other cleaning utensils. Clean the refrigerator or pantry at the spot where the food was stored. Check nearby items the moldy food might have touched. 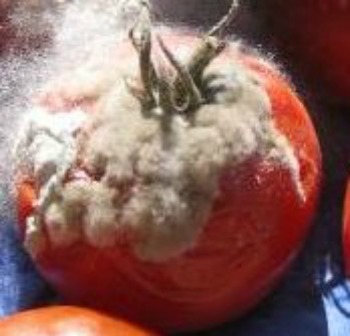 Mold spreads quickly in fruits and vegetables. Keep dishcloths, towels, sponges and mops clean and fresh. A musty smell means they’re spreading mold around. Discard items you can not clean or launder. Keep the humidity level in the house as low as practical – below 40 percent, if possible. When serving food, keep it covered to prevent exposure to mold spores in the air. Use plastic wrap to cover foods you want to stay moist (fresh or cut fruits and vegetables, and green and mixed salads). Use leftovers within 3 to 4 days so mold does not have a chance to grow. Do not sniff the moldy item. This can cause respiratory trouble. If food is covered with mold, discard it. Put it into a small paper bag or wrap it in plastic and dispose in a covered trash can that children and animals can not get into. Scrub mold off surface. It is normal for these shelf-stable products to have surface mold. Cut off at least 1 inch around and below the mold spot (keep the knife out of the mold itself so it will not cross-contaminate other parts of the cheese). After trimming off the mold, re-cover the cheese in fresh wrap. Mold generally cannot penetrate deep into the product. Soft cheeses such as Brie and Camembert if they contain molds that are not a part of the manufacturing process. If surface mold is on hard cheeses such as Gorgonzola and Stilton, cut off mold at least 1 inch around and below the mold spot and handle like hard cheese (above). Molds that are not a part of the manufacturing process can be dangerous. Cut off at least 1 inch around and below the mold spot (keep the knife out of the mold itself so it will not cross-contaminate other parts of the produce). Small mold spots can be cut off fruits and vegetables with low moisture content. It is difficult for mold to penetrate dense foods. Fruits and vegetables with high moisture content can be contaminated below the surface. From The University of Illinois, College of Agricultural, Consumer and Environmental Sciences, Horticulture Solutions Series. Science Explorer, published by Owl Books, Henry Holt & Company, New York, 1996 & 1997. Food Safety Focus, USDA’s Meat and Poultry Hotline. I Had Just Purchased A Package Of Assorted Peppers [Red,Yellow/Banana,An Orange] The Other Day, [Saturday, March 11]. When I Took Them Out Of The Package Today and Cut Them Open To Use Them, I Saw The Middle Of Them That Had Fuzzy Middle On The Seeds. I Sliced A Few Off On The Sides, Thinking It’s “Safe” To ‘Mixed’ Them In My Ground Meat. Was That “Best” For Me To Do! Why Was They So Fuzzy In The Middle When They Supposed To Have Been Fresh and Package? I Would Like To Thank You For Your Comments and Suggestions With This Matter Of Mine. Near the bottom, you say “Fruits and vegetables, soft (such as cucumbers, peaches, tomatoes, etc.) – Discard”. The word “Discard” is in green, where everywhere else in the list it’s red. This might be confusing, people skimming the list quickly may even think “Fruits and vegetables, soft” are in the “Use” rather than “Discard” category. That was my first impression. Thank you for pointing that out. I made the change. Hi, I have had a black mold that was on a food item that was in a bowl and wrapped in plastic in my fridge. I have thrown it away and cleaned the fridge out. The smell still remains and anything that goes in there comes out smelling of the mold. Is it dangerous? How urgently should I try again? Thanks in advance. I was bought a cake for my birthday. It’s a LARGE sheet cake. It was refrigerated from June 4- 7 then I took it home and didn’t put it in fridge. There is now some mold on the exposed end of the cake. Cover has remained locked over it. Its 18 in long and about 9 was eaten. Mold only visibly covers the exposed end. Wondering if the unbothered section not cut into yet might be safe.